DEFEND HER SPORTS/DEFENDER SPORTZ, established in 1996 as an independent company, is a survivor of our family-run company founded in 1930. I was extremely fortunate to be able to work side-by-side with my grandfather, father, brother, sister and 600 of the most talented people who ever worked in apparel manufacturing. We spent every holiday and birthday together. We truly were one family, albiet a BIG one. I literally grew up my families, what came to be our 73 year old, made in the USA, manufacturing facility in the heart of South Philly. During the 28 years I worked there, I learned every aspect of the company, including manufacturing, design, product development, distributing, customer relations and sales. And I began at a very early age. I started by playing hide and seek among the fabric rolls. I also poly bagged and packaged the athletic accessories, modeled, answered phones, and filed paperwork. As I grew older and got more involved, I traveled to New York’s garment district to select new fabrications, designed many of our best selling styles, managed the photo shoots for our catalog and ran a successful sales group of over 54 Independent Sales Reps. It’s safe to say I learned to do every job there! I attended the Philadelphia College of Art and finished my education at the Philadelphia College of Textiles and Sciences. It is through these outstanding learning facilities that I was able to develop the company’s most advanced quality control department. My patent and trademark on our exclusive protective pads were worn by every NFL, CFL, Arena and Collegiate football player. We manufactured for every top label in our Country. In 1988,I renamed our Reed Street line to the Defend Her Sports label specifically for women and used the Defender name for Men’s. We became a national label and were carried in every Mass Merchandiser’ store in the United States. We work with you every step of the way to ensure that the final product is your dream come to life. Custom athletic and team apparel. I personally work closely with each and every customer to ensure we are covering every detail to make your ideas come to life. We, The El Paso Seminoles, have partnered with Debi Mohl- Mills to fulfill all our apparel needs. We have been with Debi since last season. We can say that she has excellent customer service. Last season she did the impossible by fulfilling our 48 home and 48 away uniforms in two weeks. From the start, she insured our owner Gregory Hollinger that all our apparel needs will be met in a timely and efficient manner. Since then we have reached heights that most NFL and College teams are meeting. We broke the barrier this year by changing our uniform style to the Gridiron pattern, which is mostly worn by the NFL and College level. She manufactured our new look. She is an excellent business woman that we will recommend to any team that is in need of uniforms or any other apparel. We also we like to inform all our fans, supporters, players, staff, sponsors, and partners that she will be also manufacturing our fan jerseys this year also. On behalf of our organization and team we want to thank Debi for all the hard work and great customer service that she has done for us. Thank you Debi. We are grateful to be in business with you. Just want to show how excellent the work by Defender Sportz and Debi Mohl- Mills is. Very proud to partner the Yukon Bobcats with this awesome company! The SSFL, Sugar N Spice Football League is happy to announce a partnership on uniforms for the 2016 Season, with Defend Her Sports and Debi Mills. Looking forward to the new styles, fabrics and travel gear for our League. We will certainly be looking Pro, with the line we have developed with Defend Her Sports. Welcome aboard Debi Mills! We have opened a new location near Delaware, redesigned the shop, added new products & services. We will still have our personal facilities overseas but are now focusing on being MADE IN THE USA. Customers have questions, We have answers. Just ask so everybody benefits. Custom Made Items: ALL CUSTOM MADE ITEMS OR LETTERED ITEMS MAY NOT BE RETURNED OR EXCHANGED. • Examples of items that are not returnable include but are not limited to: Made-to-order uniforms, warmups, jackets and dancewear; lettered or silk-screened items, Athletic apparel, chenille, socks. 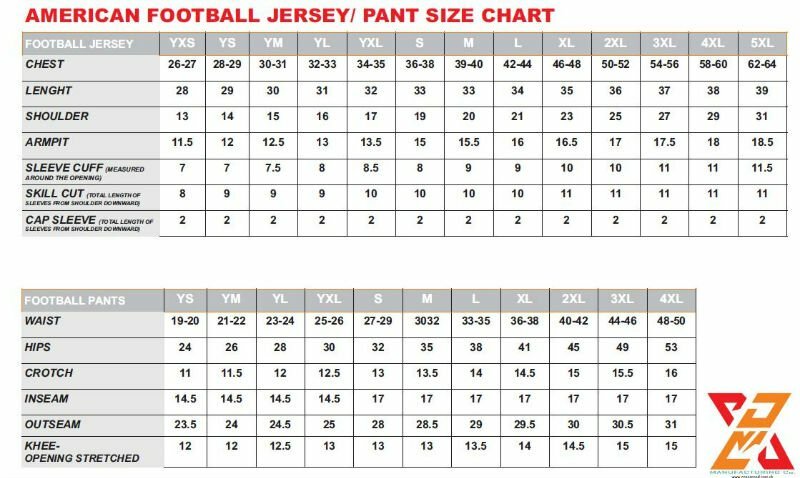 • You may be ordering uniforms for growing athletes. While Defender Sportz will remake custom items in the case of a defect in materials or workmanship, Defender Sportz is not responsible for replacing uniforms that have been outgrown. • Items that have been worn, soiled, laundered, or altered in any way cannot be returned. • Due to health regulations,compression shirts, briefs, tights, uniforms, items worn in contact with body fluids are not returnable.